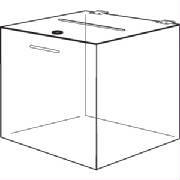 Visit our showroom for our complete collection of acrylic bins, ballot boxes and counter top showcases. Add your store logo or contest flyer to the front or high back. Three sizes to fit food items, small toys, and many other uses. 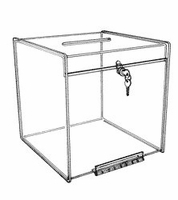 Three sizes can be used alone or together, stacked in a graduated unit or using the same size unit on top of itself. The angled front is hinged. Useful for many display needs. Lock and keys come with each unit. slatwall hooks to add to your display.